Have you ever had an autograph literally fade away and disappear? How about an important card or picture yellow? Ever seen brilliant colours fade? How about a computer crash and now you only have a few prints of those favorite photos you thought you could produce at will? Of coarse all of these not only affect you emotionally, but also can be felt in your wallet! If it’s worth framing, then it’s worth protecting! You have heard about conservation glass and UV acrylics, but now there is an easier and less expensive alternative with the new Picture Shields UV inserts. Let’s start with the basics. There are four main causes for fading over time. Number 1 is Ultraviolet (UV) light from direct and indirect sunlight. This invisible band of light is the same type which causes your sunburn. It accounts for almost half of the fading. Number 2 is heat. Again, primarily from the sun, but also other heat sources like fireplaces and heat ducts. Number 3 is visible light. 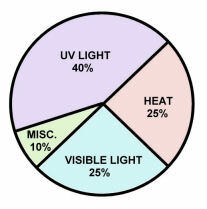 Most visible light contains some UV, particularly those florescent bulbs that are becoming so popular. They produce many times more UV than an incandescent bulb. Number 4 is a potpourri of things like dust, grease in the air, and humidity. Even oxygen over time helps fuel the decay of the organic composition in the pigments and papers. So the first step is to minimize the damage from these sources. Use incandescent bulbs to light them, and with the lowest possible setting. 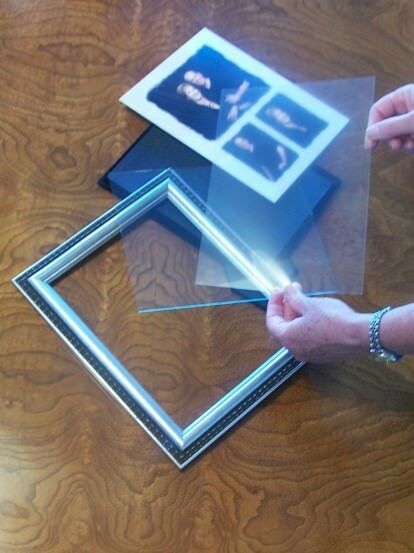 Cover the item in a frame to keep it as clean as possible. Be careful of having the piece directly against the glass as items like older photos could actually attach themselves to the glass and when removed will stick to the glass and become damaged. Use an acid free mat to separate. The next step is to add protection to limit the UV damage. There are several commercial products that have been developed over the years to help reduce the amount of fading. No product will eliminate fading. It is important to select a product that will reduce at least 95% of the ultraviolet radiation but preferably 99%. Each has its own strengths, and weaknesses. Cost, percentage of protection, ease of use, scratch resistance, glare control, and cleaning are all important considerations. There are basically three types of conservation glass. First is the “Conservation clear glass”. It blocks 97% of the UV, and has a slightly greener tint to it than regular glass. These tints tend to disappear when placed in the frame and is generally unnoticeable except to the trained eye. Next is the same glass but with “reflection control”. This glass has an etched surface that helps diffuse the light so there is less glare. It is more expensive that the standard conservation clear glass. The best glass available is “Museum glass”. It is extraordinarily clear, blocks 97% of the UV, has a non reflective surface superior to non-glare glass, and is also extraordinarily expensive. This is the ultimate product and best used for those pieces of high value. All frame stores carry and promote these types of glass. Some do not even offer standard pane glass anymore for framing. This product has multiple attributes that many admire. They block 99% of the damaging UV, are half the cost of conservation clear glass, and maybe best of all, is very difficult to break. People with young children should consider this type of product to help “childproof” the frame. The downside is that it can be easily scratched, and needs a special cleaner with soft cloth. Even a paper towel will easily scratch this surface. The Plexiglas is a standard stocked item at virtually all custom frame stores. These include products like the Krylon protecting spray. It is inexpensive and was designed primarily for digital prints. Many scrap booking enthusiasts love this product but you may not want to be the one experimenting on your professional printed photos or other types of materials such as trading cards or documents. It is considered a soft product and can be easily scratched. Some have mentioned it is difficult to get an even coating but again for its intended purpose it works well. The spray can be found at many Craft and Scrapbooking stores. This is a brand new product suitable for any glass framed object. They are a 7 mil tri-laminate that comes in precut 8X10 or 5X7 sheets. The product can be custom cut up to 20 inches or customized yourself by simply using scissors. They block 99% of the UV, are scratch resistant, and are half again the cost of Plexiglas or Light Impression’s Acrylite. They also have a matt finish for glare control. One other nice feature of the product is that you can place the insert on the inside of the glass to protect the framed object if the glass should break, or you can place it between the frame and glass to help retain the shattered glass if broken and “childproof” the frame. By far this is the most protection for the best value in the vast majority of cases. It’s been long overdue and worth trying. Unlike the green tint of the conservation glass, the UV coating has a yellow tint. As with the conservation glass the yellow tint seems to visually fade away when placed into the frame against the glass. The inserts and custom cuts can be purchased at the company website pictureshields.com. Can this picture or item be replaced? Do I have a lot invested in this piece? Do I want to maintain the value, the colors? Am I going to display this item for many years? Does it have great sentimental value? Once you have decided to frame that new treasure or upgrade an existing framed piece, you will want to protect it so that you may enjoy it for many years to come. Consider the cost or rarity of the item. It may be a piece you have invested a good sum of money on and wish the absolute best protection, or it may be a color drawing your child did in Kindergarten. Both have a special value and need protecting. You may have dozens of photos in your home that you will be viewing for many years or hand down to your children but you may not want to spend the money to put each behind museum glass. It may be an autographed picture, sport card display, or a watercolor you have always loved. Will it need glare control where it’s placed? If the glass breaks will the picture or a child be at risk? What about cost? You now know the options, and with the new Picture Shields the cost has come down far enough to protect many of your most important possessions. Have you ever noticed on the news what people rush to collect if placed in a position of a quick evacuation such as a flood or fire? First are their family members, then their important papers, and then when interviewed they always mention their photo’s or an heirloom. In fact, what is it on the bedside of those dear souls in Hospice or other care facilities. I’ll bet it’s in a 5X7 or 8X10 frame. Truth is they are some of the few items we literally carry with us through our entire lives and hold most dear. If it was worth framing, it was and is worth protecting.